Even if you have never suffered persecution, you still need to read this post. Why? Because at some point in your life, you will, which is why it is better that you decide now how you are going to respond. When we anticipate something we are much more likely to respond than react. Reactions are usually bad, but well-planned responses can be great! 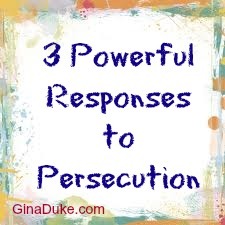 Watch my video for the 3 powerful and preferable responses to persecution. The Miriam-Webster online dictionary defines “Persecute” as “to treat (someone) cruelly or unfairly especially because of race or religious or political beliefs.” Acts 7 delivers the account of the first New Testament church martyr in the person of Stephen. Interestingly, after Stephen was stoned to death, Acts 8:1-4 states that all but the apostles scattered and preached Christ wherever they went. Persecution makes Christians talk (or shall I say “evangelize”, which is the opposite of Satan’s desired outcome). I can only imagine as Christians entered new towns, the citizens asking them, “So, what brings you here?” and the Christians telling their story about Jesus with great passion and conviction. The enemy thinks he can pressure us into to sitt’n down and shutt’n up, but we are not hav’n it! We are simply not wired that way. In this beatitude: “Rejoice and be glad, because great is your reward in heaven, for in the same way they persecuted the prophets who were before you,” Jesus is clearly saying in His Manifesto, that He does not intend for those who are in the Kingdom of God to be wimpy! Obviously, that would not be very attractive to Christian prospects. We should not tuck tail and run at the first sign of mistreatment. Instead, we should dig in! When we rejoice over the one thing the enemy thinks will intimidate us it sends confusion to the enemy camp. (See 2 Chronicles 20). When the church follows Jesus’ Manifesto (the Beatitudes), we demonstrate God’s infinite wisdom to the enemy! Did you get that??? WE (the Church) is God’s demonstration of wisdom to Satan when WE respond appropriately to persecution! When we “act right”, we remind the enemy why God is BOSS! Next time you feel persecuted, remember it is coming from the enemy so respond appropriately, and make him scratch his head!